If you need a ruggedized smartphone and are on a budget, the Homtom HT20 should be high on your shopping list. 10 screws to secure the back! Rugged smartphones are becoming more popular amongst users and manufacturers for a few good reasons. For the former, while more expensive, they are better value for money especially if you tend to drop devices and end up, more often than not, with a smashed screen. For vendors, the lure of much higher margins has proven to be far too attractive to miss. This explains why a number of lesser-known Chinese vendors (BlackView, Nomu, Ulefone) have jumped on the rugged bandwagon, following the likes of Samsung and Panasonic with the Galaxy Active and Toughpad series. That brings us nicely to this latest offering, the Homtom HT20, which is available in no less than four colours: black, orange, white and olive green. Oddly enough, you will be paying a hefty premium – around 23% – for the first two. The HT20 costs around £103 (about $125, AU$170) at the time of writing direct from Gearbest, the online Chinese retailer that provided us with the review sample. As with some of the other rugged smartphones we’ve reviewed recently, this one carries an IP68 certification which means that it is waterproof (can withstand depths of more than 1m of water for more than 30 minutes). What becomes apparent within a few minutes is that Homtom takes the concept of durability to another level with the HT20, for better or worse. The back of the device is completely removable unlike most of its rivals. However, this means that every time you remove the battery, a 3,500mAh model (which is charged using a 5W power supply unit), swap SIMs or even plug in a microSD card, you will need to remove 10 screw covers and 10 screws (using the bundled screwdriver) as well as a translucent rubber cover which protects the electronics. But that’s not all – Homtom claims to use a magnesium alloy frame to make the HT20 resistant to shock. That frame is covered with plenty of rubber to absorb bumps, and as expected, the screen is protected by Gorilla Glass 3 and works flawlessly even when used with gloves. The display adopts the same format as many of its competitors: 4.7-inch and 1280 x 720 pixels. Opting for a smaller screen theoretically improves resistance to shatter and shocks, while a lower resolution should improve battery life, plus when you wear gloves, bigger-sized icons are preferable anyway. The ports (USB and audio) are covered by a rubber flap. Now, with our review sample, the flaps were very solidly anchored in place, so much so that it took more than a few seconds to open them. An example, perhaps, of taking resilience a tad too far, but we can see why Homtom does this. Oh, and this phone does have a notification LED, something that is all too often left out by the competition. At 76 x 152 x 13mm, the HT20 fits nicely into an average person’s hand, and while it weighs well above 200g, it compares favourably with others. 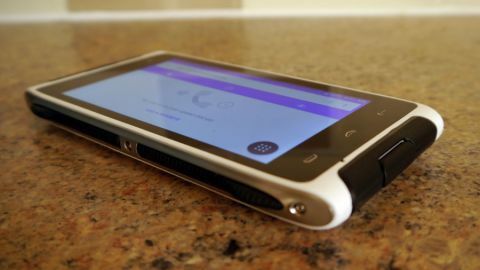 Inside the device is a Mediatek MTK6737 system-on-a-chip, a quad-core model clocked at 1.3GHz with 2GB RAM and 16GB on-board storage – the latter can be augmented via the microSD slot. The SoC is a 64-bit model using ARM’s Cortex-A53 cores and a Mali-T720MP2 GPU. Flip the handset over and you will find a fingerprint reader – we’re not sure about the use of such a feature on a rugged smartphone, especially as it adds another point of failure and is obviously inconvenient if you wear gloves. But it is a fast sensor (200 milliseconds, says Homtom) and is something unique amongst rugged smartphones. It supports dual SIMs and dual standby, with a rear 8-megapixel camera sensor, the Sony IMX219 Exmor RS, and a front-facing 2-megapixel snapper. Homtom mentions that both support software interpolation and this is done transparently by the bundled photo app, with the latter showing a 13-megapixel option only. The HT20 runs stock Android 6.0 and didn’t have any updates at the time of writing. It didn’t carry the full set of Google Services (so no YouTube or Google Chrome) but Play Store and Gmail are present. Other added features include smart gesture, wake-up gesture and HotKnot, which is similar to NFC. The rest of the feature list is standard on most entry-level devices: 802.11n Wi-Fi, Bluetooth 4.0 and USB OTG. This is a tricky one. There is no question that the HT20 represents fantastic value at just over £100. The system-on-a-chip is adequate for most mundane tasks, but this is definitely not a gamer’s smartphone. Instead, its strengths will appeal to the target audience: those looking for a ruggedized handset. IP68? Check. Display that supports gloves? Check. Ultimately though, there are better models on the market. The Blackview BV6000, the Ulefone Armor and the Nomu S30 are the main competitors, but they are all far more expensive than the HT20 with improved feature sets. There are some minor annoyances such as the lack of a rapid charger (5V/1A is simply not powerful enough) and the multitude of screws used to secure the backplate. But none detract too much from the sheer value-for-money of the HT20.